Camping du Vivier aux Carpes si trova a Seraucourt-le-Grand, Aisne, è situato a un lago. Questo campeggio dispone di piazzole delimitate e piazzole poco ombreggiate. È possibile affittare casemobili e bungalow. Il campeggio dispone di un parco giochi e di un parco giochi al coperto. Ogni anno un ispettore visita il Camping du Vivier aux Carpes, controllando oltre 200 tra attrezzature e altri punti di interesse del campeggio. L'ispettore è un dipendente ACSI e non lavora per il campeggio. great 3 days here in June only the noisey frogs at 2am to comment on. Nice village in walking distance provided most services. Resturant there not open very often. We stayed here for 5 nights in June 2018 with a 7 metre caravan and had an excellent pitch at the far end of the lake. Facilities are very good and the staff were welcoming. We will be staying here again in September 2018. Went in off season, very welcoming, lovely site, pitch right next to the fishing lake. Only stopped overnight, but felt very welcomed. En-route north we just picked this from acsi book. A very pleasant site and we stayed longer than first intended. Bread van daily in morning. Madam pleasant and speaks English, lots of english on site. About 4 miles from Motorway and close to small village, some nice walks nearby and near to lovely kept but sad Allied British Cemetery. Fishing pond on site had recently had major total loss of all carp stock and was pretty sad to see. Fished the lake with some bream success, seasonal pitchers had there own private pegs at top end. Wouldn't go just for the fishing on site unless news of re-stocking. There is a large commercial type fishing pond complex in the village - not fished but used by locals. We would return. As always its easy to pick fault with sites on balance but we liked it ! Very near the war cemetery at Séraucourt. Pleasant site with good shop nearby but when we arrived the receptionist blithely told us they only had a few ACSI pitches and there were none available - even though the site was nearly empty and it was not outside their ACSI dates - so beware! A very useful site as a stopover to/from the Channel but otherwise to us it was unremarkable. Very Brit dominated also the toilets may well be under pressure in the high season. MH pitches are very tight but ok for a night. Keep your eyes on the children - we had water on both sides of our pitch!! Everything worked ok but no bread van as promised. Lots of statics. Will use again as stopover. Very friendly and helpful staff. All pitches were full but a very nice over flow area. Visited by hedgehogs in evening and otter passed by while having evening meal. Recommended. 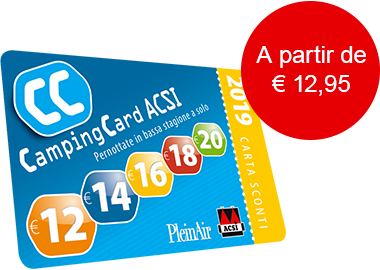 ACSI Eurocampings invia la tua richiesta di informazioni al "Camping du Vivier aux Carpes".